In part 1 of this series, I mapped out a general outline of Paul’s Letter to the Ephesians. That outline will serve as a template on which we will unpack this wonderful concept of “Love Incorruptible,” which is at the center of this letter. If we’re going to have any discussion about love, especially love that is indestructible or incorruptible, we could never begin with ourselves. The animosity that we have toward God and others is now part of the human experience in our post-Genesis 3 world. If we’re going to have any discussion about love- indestructible, incorruptible, eternal love- we must always begin with the being whose whole essence and existence exudes holy, righteous, and everlasting love. And indeed, we’ll see that that’s exactly where Paul begins. In the first two verses of Paul’s letter to the Ephesians, we find a very familiar Pauline greeting. From these simple opening words (words we often skip right over), Paul identifies the source and the blessings of divine love and favor; this is the source of all that will follow. First, let us consider that Paul identifies himself as, “an apostle of Christ Jesus by the will of God”(v.1). While it appears that Paul wishes to remind his hearers of his apostolic authority so that what follows would be understood as binding; There is certainly no trace of pride or arrogance associated with this identification. In other places, Paul clearly identifies himself as the, “least of all the apostles,” and, “the worst sinner” (1 Cor. 15:9; 1 Tim. 1:15). Paul would have been the first to acknowledge that this opening sentence, identifying himself as an apostle, is filled with the theme of sovereign, unconditional grace, love, and mercy on behalf of God. Knowing very well who he was and what he had done to the Church, Paul reminds us of his apostleship, not to grab power or authority in a covetous way, but to allow us to revel in the glorious grace that God pours out on sinners of whom Paul considered himself “chief” (Acts 7-9). Having established his grace-given authority as an apostle and emissary of Christ, Paul then issues the opening benediction. “What is amazing?” you might ask. Unfortunately, we often skip over these opening verses so quickly; treating them as nothing less than a “to whom it may concern,” or some other generic greeting. But this phrase is packed with so much more. Think about it: a representative of the authority and power of Christ himself relays to us a blessing directly from God the Father and the Lord Jesus Christ. A message of grace and peace. The fact that we skip over this immense space so often reveals that we are completely jaded to God’s grace. For those of us that were raised in church, we have read about it, sung about it, and heard it preached all our lives. We have simply grown accustomed to thinking of God as gracious, merciful, and loving (which he is). For those that were not raised in church and are new in their faith, while maybe easier to understand, grace is nevertheless a concept that has not been fully realized (if it could ever be until eternity). We have become so accustomed to the idea of God’s grace that we take our peace with him for granted. We’ve simply come to the point where we expect grace and peace from God. That’s what he does, right? God is love, right? That’s just who he is. Why shouldn’t we expect grace and peace from God? I’ll get to chapter two in detail in a later post, but just a quick glance at the first three verses in that chapter will reveal why Paul’s blessing of “grace and peace from God” is so earth-shattering. These three short verses are an indictment against humanity apart from the grace of God in Christ. In today’s culture (and even within the Church), we so often think of God solely in terms of his love, mercy, and grace. The doctrine of Hell, any real punishment for sins by a wrathful God (even the idea God has wrath) is a hard pill to swallow these days. I would go so far as to say that many Christians don’t even understand this to its fullest extent. This is evidenced by the fact that we see an offer of “grace and peace” from God and give it nothing but a passing glance as we get to the “meat” of Paul’s letter. According to Paul in Ephesians 2, apart from Christ, we follow nothing but our own sinful lusts and desires; we follow after Satan himself; we recklessly abandon self-control to obey our baser desires and instincts; we are dead in our sins and trespasses against God’s holy, righteous Law. What stupefying grace is it then to hear, “grace to you and peace from God”! What unfathomable mercy and pardon is this that we, who should expect nothing more than God’s judgment and wrath, should be greeted and offered his grace and peace?! The key lies in the fact that God is not simply identified here as God the Father, which he most certainly is to all mankind, even the whole universe. But God is identified here as “God our Father,” literally, “God, the Father of us.” I would submit that the wonderful change that has taken place here is due to the fact that our relationship with God has been essentially, unequivocally, and intrinsically changed at the foundation. The reason we have to experience God’s grace and peace comes to us through the fact that we not only know him as God the Father, but somehow now know him as God our Father. What unsearchable grace and love is it that the God from whom we deserve nothing more than death and Hell now offers us grace and peace as his children. 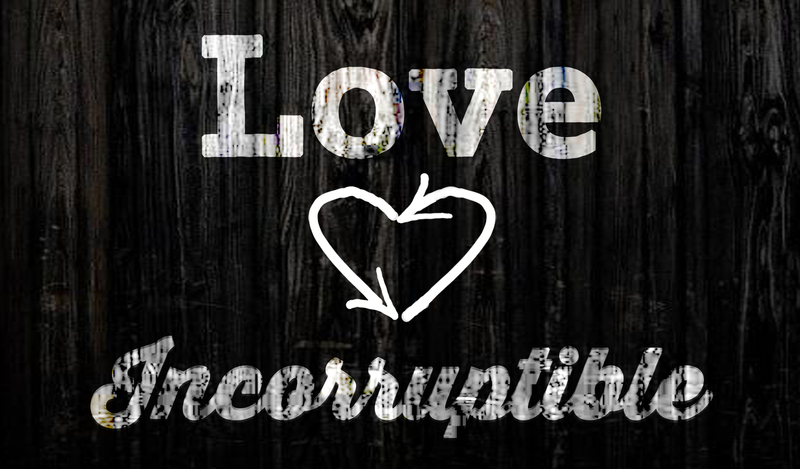 This, and nothing else, is the foundation for incorruptible, indestructible love. That God would act in time and space so as to make his enemies not just his friends, but is own children! We could have no real further discussion about “love incorruptible,” without first establishing God our Father as the true source and fountain from which it must flow. As to how we are made God’s children; We’ll see as we pick back up next time in Ephesians 1:3-10.